The final highly anticipated day! Today is a drawing for Half Off a Full Session! One entry per person. Cannot be transferred. To enter you must “LIKE” Diana Busch Photography on Facebook, SHARE the link to the blog post on your Facebook wall and then LEAVE A COMMENT with your name in a comment ON THE BLOG POST. Only entries on the blog post (not the Facebook post) will be accepted until 12/13/16 at 11:59 a.m.
All comments are time stamped. The winner will be chosen randomly and announced by midnight on Wednesday. $200 value, $200 plus tax due at the time of session. No person limit in your session. One person limit. Cannot be transferred. 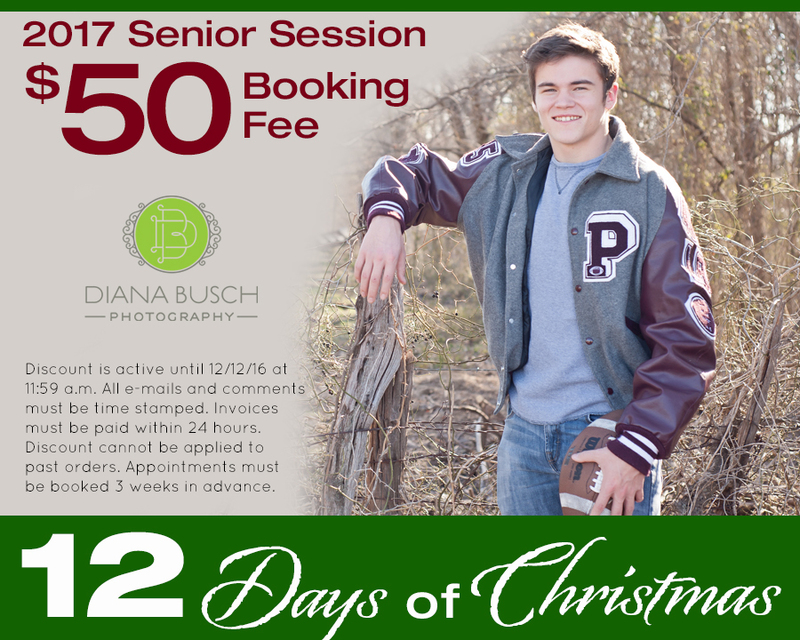 Get your appointment scheduled before the rush with half off your 2017 Senior Booking Fee. Discount is active until 12/12/16 at 11:59 a.m. All e-mails and comments must be time stamped. Invoices must be paid within 24 hours. Discount cannot be applied to past orders. Appointments must be scheduled 3 weeks in advance. Are you still looking for gifts? 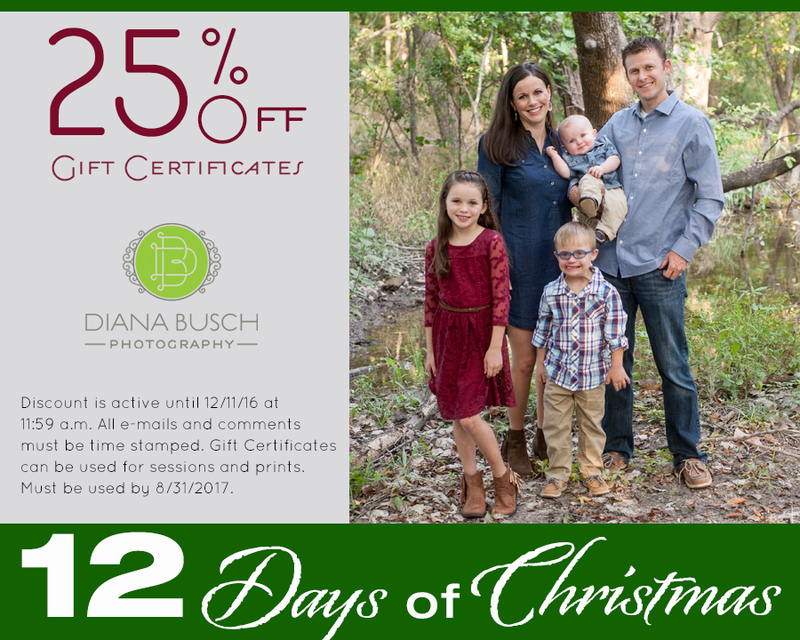 A gift certificate to Diana Busch Photography would make the perfect gift this season, and at 25% off you gift yourself also! Discount is active until 12/11/16 at 11:59 a.m. All e-mails and comments must be time stamped. Invoices must be paid within 24 hours. Gift Certificates can be used for sessions and prints. Must be used by 8/31/2017. 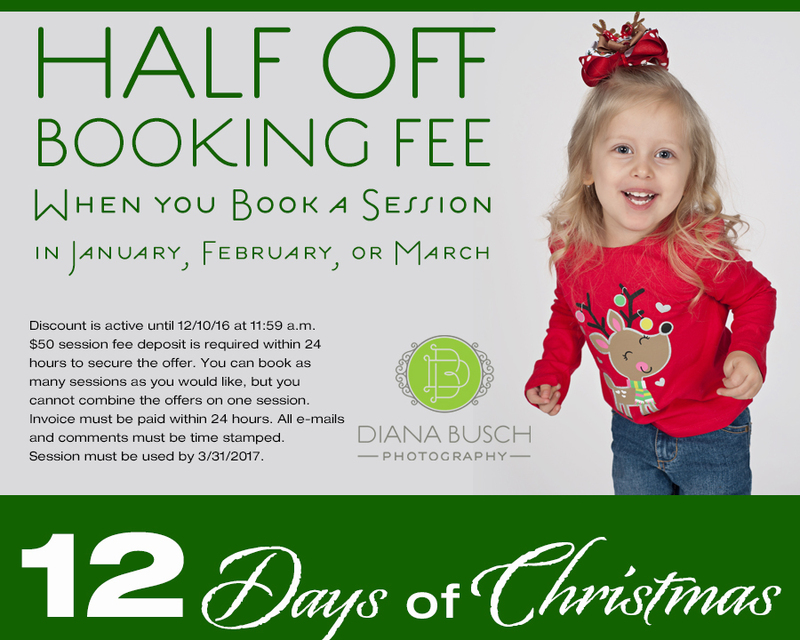 Half Off A Book Fee When You Book A Session In January, February or March! Discount is active until 12/10/16 at 11:59 a.m. $50 session fee deposit is required within 24 hours to secure the offer. You can book as many sessions as you would like, but you cannot combine the offers on one session. All e-mails and comments must be time stamped. Invoices must be paid within 24 hours. Session must be used between 1/31/2017 and 3/31/2017. This is a great way to capture your children over the next year! A 2017 Seasons Package. 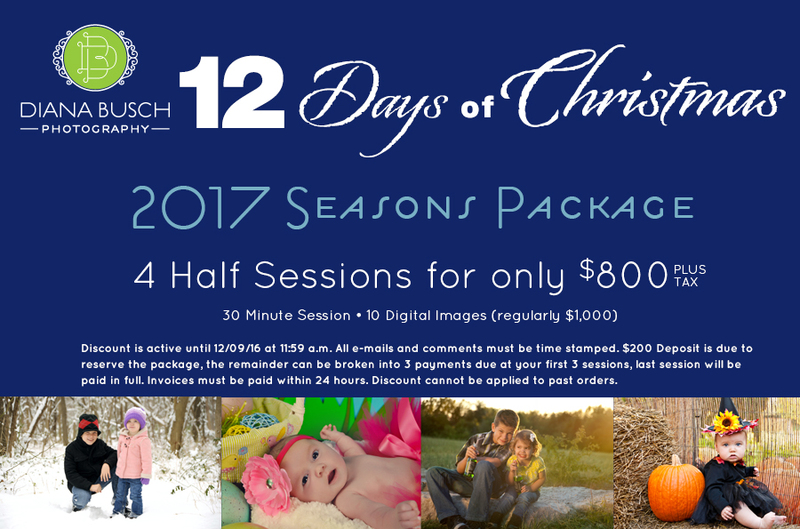 Get 4 Half Session Packages for only $800. This include 4 – 30 minute sessions each with 10 digital images. (regularly a $1000 total). You can book a Winter, Spring Summer and Fall Session. Or A Valentine, Easter, Back To School And Halloween or Christmas…any way you would like to book it! Prices do not include tax. Discount is active until 12/09/16 at 11:59 a.m. All e-mails and comments must be time stamped. A $200 Deposit is due to reserve the package, the remainder can be broken into 3 payments due at your first 3 sessions, last session will be paid in full. Invoices must be paid within 24 hours. Discount cannot be applied to past orders. Last Chance for Print Savings! This is the last chance in the 12 Days of Christmas Deals to get print savings. Do you still need cards? Albums? Wall Prints? Gift Prints? 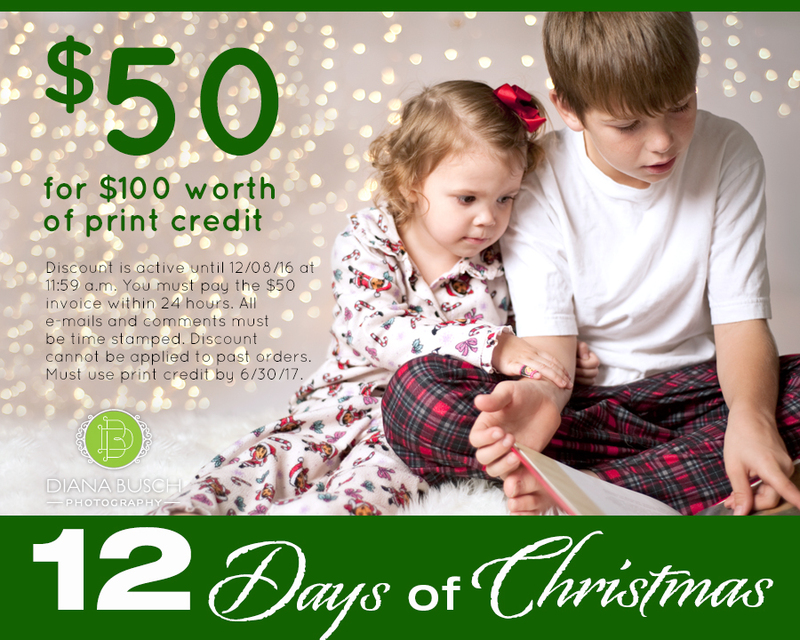 Today only you can get $100 worth of print credit for only $50. Prices do not include tax. Discount is active until 12/08/16 at 11:59 a.m. You must pay the $50 invoice within 24 hours. All e-mails and comments must be time stamped. Invoices must be paid within 24 hours. Discount cannot be applied to past orders. Must use print credit by 6/30/17.